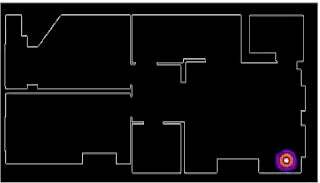 How do you determine the optimal placement for a wifi router? For most people, this could be an exercise in design, or in outlet location and cable length, or maybe where it's most convenient to frequently reset. For a physicist, it involves solving the Helmholtz equation. Jason Cole is a PhD physics student in London. He researches laser-wakefield acceleration at the John Adams Institute for Accelerator Science at the Imperial College of London. The field sounds like downright evil villainy: not content with conventional particle accelerators, he fires ultra high-powered lasers into tenuous plasmas, generating strong electric fields that accelerate electrons thousands of times faster. I'm certain there's no chance at all that's going to be the inspiration for a doomsday machine... When escaping the frustration of dealing with inevitably malfunctioning equipment, he dabbles in numerical methods. That's where today's story starts. Instead of snaking LAN cables throughout his new flat, he switched his desktop computer to a wifi card. Alas, the signal was wonky, dropping out far more often than can be politely tolerated. Undaunted by the initial lackluster performance, he sketched up a layout of his new apartment, and set MatLab to ray-tracing to see how the signal was bouncing around the space. Only a few lonely rays were reaching the concrete corner where the computer was located, explaining why signal was less than sufficient. A bit more tweaking, and Cole was able to adjust the router's position within the model, visually observing the signal flux map to decide if reorganization would solve the problem. Yet, Cole was dissatisfied. Ray tracing was quick and simple, but not particularly rigorous. A little over a month later, he returned to the problem, this time using two-dimensional Helmholtz equation, using the walls as boundary conditions. The Helmholtz equation is used to model how electromagnet waves propagate through time and space; the two-dimensional version leaves out pesky things like room height and allows Cole to check out wifi signal propagation using the apartment layout he already sketched for the ray path tracing. Writing math and equations without LaTeX is too obnoxious for me to tackle here, but Cole does this often enough to have a visually elegant layout on his blog. Head over to the Helmhurts entry to follow along with the working through the Helmholtz equation, using dispersion and refraction of the electromagnetic wave to solve for the electric field within his flat. He peppers in some excellent visualizations to reward you for slogging through the equations — the animated gif of electric node null points is particularly hypnotizing and worth a click all by itself. Finally, Cole reaches the point where he can produce electromagnetic intensity maps of his flat, where warmer colours indicate a stronger field, and black zones are null areas. I would have expected to see some region of 'brightness' around the electromagnetic source, fading away into the distance perhaps with some funky diffraction effects going on. Instead we get a wispy structure with filaments of strong field strength snaking their way around. There are noticeable black spots too, recognisable to anyone who's shifted position in a chair and having their phone conversation dropped. He started moving the router around the flat. His analysis of how different locations impact the intensity maps are entertainingly practical ("Tendrils of internet goodness can get everywhere, even into the bathroom where no one at all occasionally reads BBC News with numb legs. "), but the math still didn't seem entirely reflective of the reality he was experiencing within his flat. That's when a handy commenter piped up, pointing out that expanding the math to allow for imaginary components would more accurately reflect the concrete walls partially absorbing signals, instead of idealized perfect reflections that were causing destructive interference and frequently nullifying the signal. Consider this as further proof that just because it's imaginary doesn't mean it isn't important! Cole's solutions were getting downright plausible, but he was still leaning on one hand-wavy assumption to simplify the problem: that aside from the wave's sinusoidal oscillation, the problem was time-independent. Intuitively, this seems like a fair approximation — surely radiation moving at the speed of light will so quickly bounce around an apartment that it may as well be instantaneous! Yet, that kind of assumption is so easy to make in physics, and not always justified. In a final surge of dedicated geekery, Cole abandoned the simplification of Helmholtz equations, pulled up the full suite of Maxwell's equations of electromagnetic waves, and applied the Finite Difference Time Domain technique to numerically crunch through the problem. After the initial wave propagation at the start of the model, the results quickly line up with the Helmholtz solution from before, nicely justifying the time independent simplification. There it is: the most complicated, thorough, yet well-justified method of deciding where to situation your router for optimized wifi signal is to numerically solve the Helmholtz equations, making sure to include the imaginary component of the electromagnetic wave. If that location just happens to be in the middle of the main walkway of your home, that's the price you need to pay for perfect reception. Tip via Charles Day and the Physics Today Facebook feed. Top mashup by Mika McKinnon using Jason Cole's images. If you decide to write this story up for your science news organization, be polite and linkback to whoever brought it to your attention.